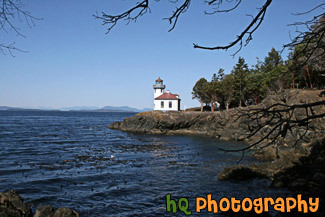 A scenic picture taken of the Lime Kiln Lighthouse seen on a sunny day with tree branches in the foreground. Lime Kiln Lighthouse is located on the San Juan Island of Washington State. This is a popular place to whale watch from the shore.